Canarian Legal Alliance are excited to be able to share with you the latest development in our pursuit of Resort Properties / Silverpoint in Tenerife for our clients. 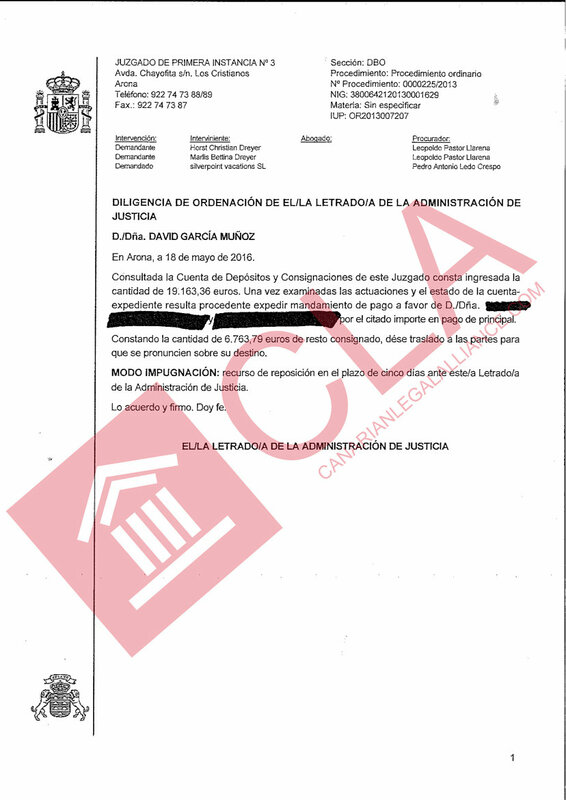 Court Number 3 of the First Instance in Arona has ordered the Resort Properties / Silverpoint to pay into the court 19,163 euros in respect of a judgment reached against them. The court found in favour of our client under the timeshare laws and guided by the Supreme Court decisions. This sentence has now been executed. The money will be finding its way back to our German clients whose relationship with Resort Properties / Silverpoint has also been terminated by the court. We are delighted by the continued determination of the courts at all levels, that illegal contracts will not be tolerated and that clients monies will be returned to them where they exist. We want to congratulate our clients and thank them for entrusting us with their case. Contact us now for a FREE consultation and see if you can get your money back.